I am so excited to share this with you today! Wonder how we celebrate Christmas in the tropics? I decided to do something a little different at The Hut this year for Christmas after seeing Maya's post Christmas in a Jar @ Completely Coastal. Sister and I had already decided we were not going to decorate this year, with so much going on neither of us wanted to pull everything down from the loft, unpack and then pack it back up again. BUT, it is Christmas after all and we at least needed a tree. So, when Sister left for Georgia again to visit her newborn grandson and see her son one last time before he leaves for Iraq (tomorrow), I pulled out a few Christmas balls and a lot of shells and proceeded to make the above tree. I wasn't quite sure what I was going to do, but as I looked at what I had I realized that many elements of what I had in my collection just naturally had a Christmas look to them. Starfish, of course, are perfect! The spiral shapes are so festive and shells in general are just so beautiful in form and color. Some of my white coral pieces are almost perfectly round and if you look closely you can see little snowflakes in each crater. This Chambered Nautilus would look gorgeous hanging on any tree. The Florida Sundial to it's left was an absolute must! 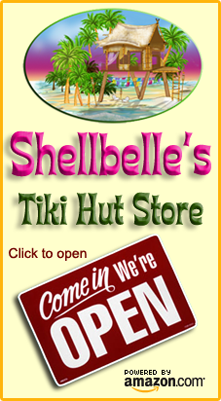 You can never have too many shells and at The Hut you will find them in every nook and cranny. 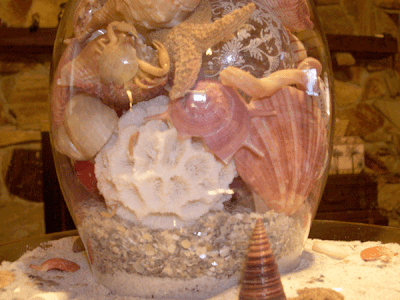 I have shells in jars, vases, baskets, boxes, bags and buckets. 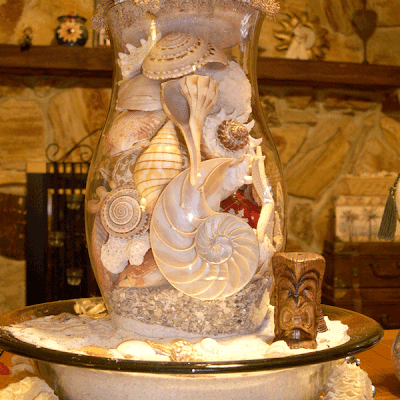 You'll find shell soap dishes, shell frames, shell mirrors and shells sitting on bookcases and in windowsills. Am I obsessed? I readily concur. I've collected shells my entire life, as did my mother and my grandmother. I have shells I've picked up, shells I've bought and shells that have been given to my by friends who know me well. Just look at these colors and shapes, aren't they wonderful and oh, so Christmassy? I used a hurricane glass cover, sunk in sand from my local beach. Inside the glass I put a layer of crushed shells that just sparkle in the light. After I was finished, I thought it looked beautiful. Then remembered I had this shell tree I made about fifteen years ago in the top of my closet. When I placed it on top of the glass, it fit perfectly and I thought it really completed the look I was striving for. I love these tiny angels at the top. I remember sitting at the table with my mom as we sorted shells, sprayed them a porcelain glaze and fashioned them into these little jewels. 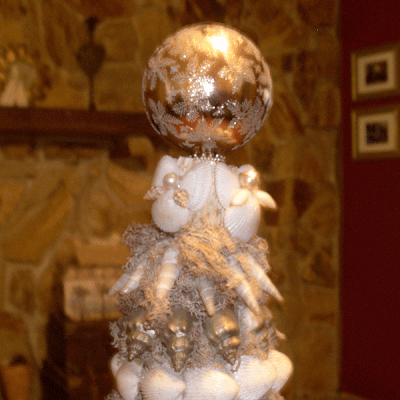 This is one of the shell angels I used to make and sell at craft shows. I probably made about a hundred of these and I'm thinking about starting an Etsy store and selling them online. What do you think? 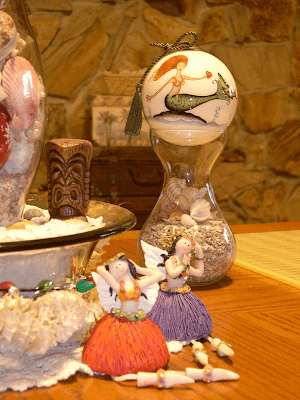 Now you know the tiki salt and pepper shakers had to be a part of our decor! 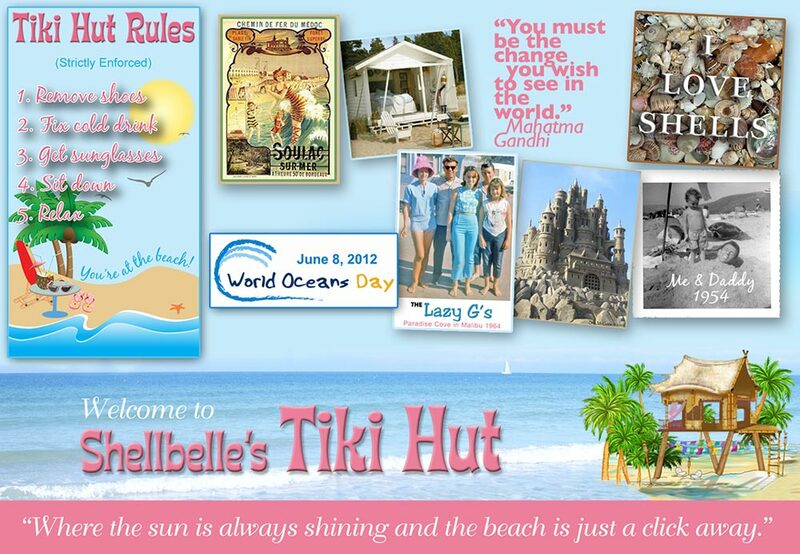 What would a seashell tree at The Hut be without them? When I was sorting through my shells, I found this little brown cone and thought it was a perfect "Tiki Tree" for them. 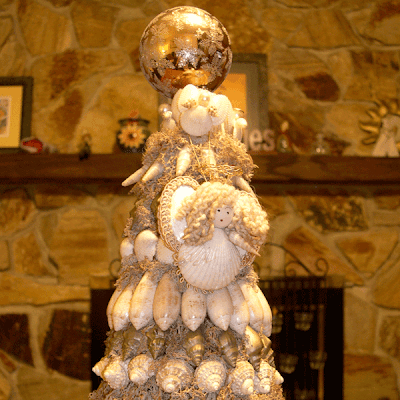 After I finished the big tree, I thought about filling a bulb vase with shells and topping it with my mermaid. I was very pleased with the outcome. 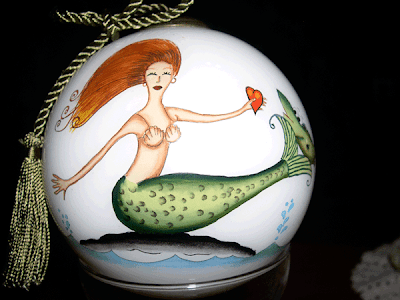 This hand-painted mermaid ornament is one of my prized possessions. Typically she resides in my bedroom, but I always bring her out to the living room at Christmas. I found these little hula angels at a garage sale a few months ago for $1 and just couldn't resist. They usually sit in the window sill above my computer, but I thought they needed to participate in all the holiday festivities at The Hut. 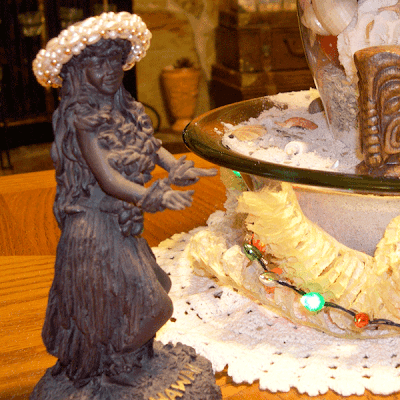 This beautiful hula dancer wanted to join in the fun, so I fashioned her a special headpiece just for the occasion. She said she likes it and wants to wear it all year. While your looking at this closeup, take note of the "garland" around the bottom of the tree. That is actually an egg casing for Lightning Whelks, one of my favorite shells and very common here is Florida. Of course, Ms. Flora had to make an appearance. 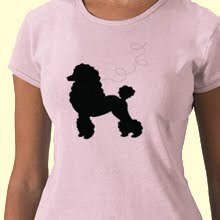 She wanted to show you her new hat before she takes off on another shopping excursion. I swear, that girl is always shopping! She thinks she's a tourist and you can always find her at the marina flirting with the boat captains when she isn't shopping. I hope you enjoyed seeing my tree, but wait……………I almost forgot to tell you something! We have a very distinguished house guest at The Hut for a few days. Some of you already know her in the blogging world and even if you don't, be sure to stop back by tomorrow and see where we went. She loved it and I know you will also. I'll give you a hint — it's very vintage, very Christmas and very Florida! She's leaving tomorrow, so we're going to be running around today, if you don't see me at your blog today, know that I will be there this weekend after my guest leaves and I get caught up on a few things. This little gal is keeping me very, very busy! I'm adding this post to our special holiday Outdoor Wednesdays over at Susan's @ A Southern Daydreamer. 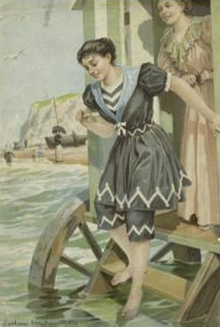 Be sure to surf on over there and click on the links for even more fabulous postings. Rhonda, how happy I am that I dropped in! What a wonderful Tampa Bay Christmas tree! 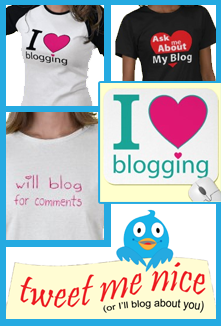 Since I'm not putting up a tree this year, I appreciate seeing Blogland's many, but yours is quite distinctive. I'm sure that Stella enjoyed her visit, and I'll bet that she took many pictures to show when she returns home to England. I always end up with so many shells after a sailing adventure and never know what to do with them. Definitely going to do this...for a yr round tree!! and YES! sell the angels...I want loads of them. Precious. and the hula girls? adorable. and all of it put together? Amazing! Thanks for all the ideas!! This is really awesome! 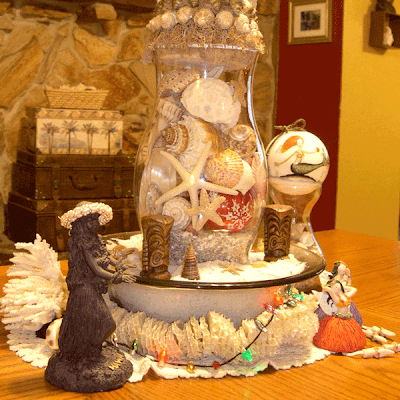 I have a huge shell collection, too, but never think about using them for Christmas decorating. 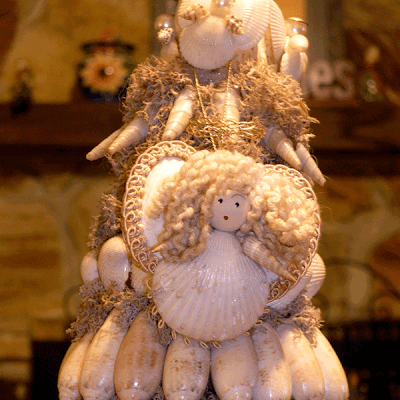 I think selling the shell angels on Etsy is a great idea - they are so cute! Oh, Rhonda, you so SHELL!! I had no idea you had such a stunning shell collection. 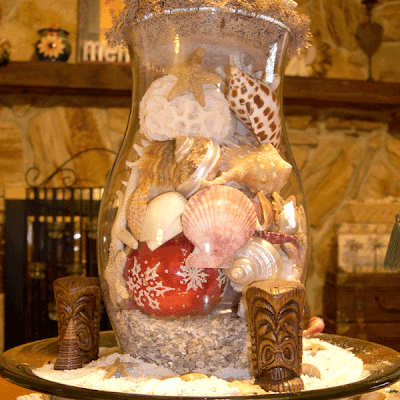 You took the concept of Christmas in a jar to a whole new level..., Coastal Christmas in a vase, topped with a shell tree!! 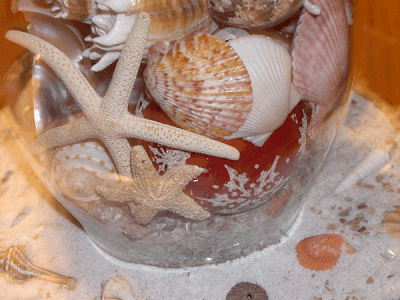 Now I really want to collect more shells and start putting them in beautiful vases..., maybe even make a tree too! 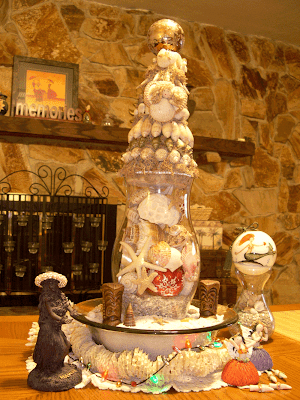 Love your amazing Seashell Tree - what a great idea! Well, now that is different. Your cute tree is certainly original and perfect for your place. 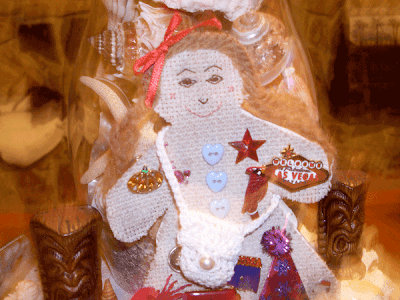 You are very creative in putting it together with all its Christmasy elements. 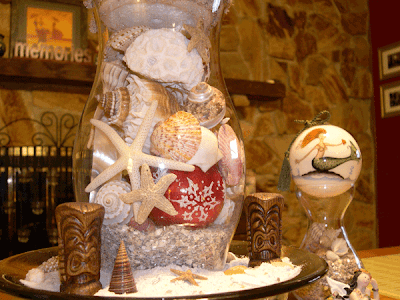 Thanks for sharing this seashell Christmas. And Stella looks like she's smiling and happy. I'm still so far behind I don't know if I can catch up. LOL! But I'm TRYING. 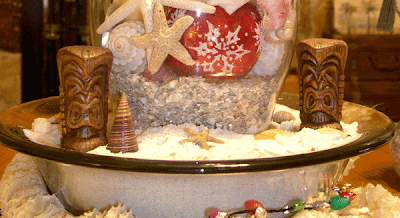 Hi Shellbelle, Wow what a gorgeous seashell tree and decoration! Now I'm really missing Florida, We usually leave for our family condo in Delray Beach each Christmas after the kids open their presents but I don't think we are going this year. Seeing your beautiful decorations is making me really teary eyed to not be down there this year. I tell everyone that I know how amazing it is down South/Florida at Christmastime. 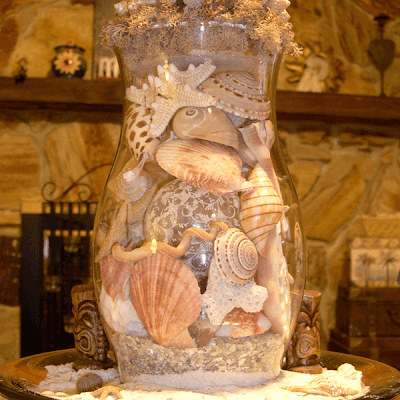 I want to do something with my seashells now...you have inspired me my friend. 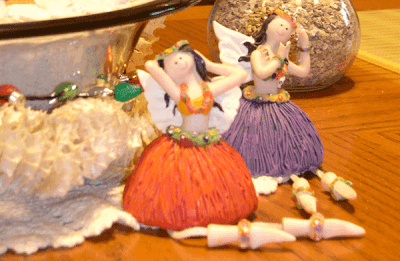 I love the hula girls too...so so cute. 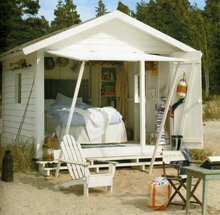 Oh I love it, you are so beachy and creative! Hmm...not sure where you went but I want to find out. Cold Plasma giveaway if you are interested at my OD place! 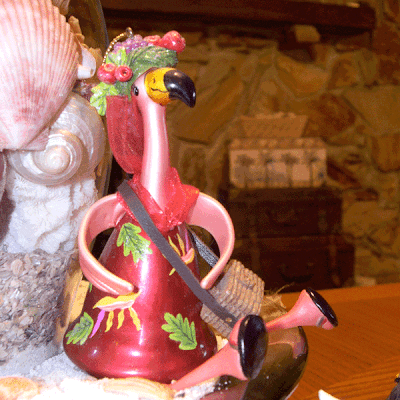 The little hula angels are the cutest and I like your centerpiece and of course the flamingo too:) I need a beach trip soon! What a creative and unique idea. I especially like the shell angel. You sure have an interesting collection. Your "tree" is so much fun! Of course I love anything Florida and it is different here at Christmas! We put garland and lights on the balcony at the hotel...just to make it feel a little more like home! What an amazing collection of shells. I just love them... fantastic collection which I'd love to have myself. I love your little shell tree too but the Angels take the cake!! so sweet! There was so much shoveling yesterday, that I had to get back to work after reading about Stella's send off and her Christmas stroll. Wow! your shell tree post really speaks to me. Gorgeous! When I woke up this morning, I discovered that the snow had taken down a 30 foot high pine tree in my yard. It destroyed part of my chicken coop and veggie garden fence. 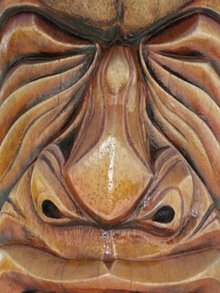 So, I saw and patch a bit, then take a blog break. Now it's back to work again. Be back soon.